Bandung, which is surrounded by a mountain path turned out to make Bandung as a city in Indonesia is very special. Famous wich has a variety of tourist attractions Bandung natural typical of the mountains or highlands are popular because of the beauty and eloquence in almost every corner of the region bordering Bandung, such as natural attractions west Bandung, there are natural attractions typical of the mountains like Mount Tangkuban Perahu and hamlets of bamboo or natural attractions in parts South of Bandung. very popular in Ciwidey with Kawah Putih, even the Bandung’s distinctive nature of the mountains of East Bandung like Caringin tilu, while Nature typical mountainous North Bandung is represented by the presence of Bukit Bintang which is very exotic and charming. Now Natural Tourism of Bandung has also been accrue by the discovery of one place New Tourism in of Bandung that paid much attention into the limelight at the same time compliment from the netizens users of social media such as Twitter and Instagram in Indonesia and even the world, the new nature tourism Tebing Keraton, in addition to simply spectacular with news and postings upload the natural scenery is extraordinary in social media, Tebing Keraton of Bandung is also frequently mentioned as one of the tourist sites in of Bandung were very thick of the mystery and mystical things. Tebing Keraton is actually a natural tourist sites are located within the attractions of Bandung which have been popular in advance the community forest park area Juanda (Tahura Juanda) in the village of Ciburial, North Dago of Bandung regency. Tebing Keraton exact location precisely in Kampung Ciharegem Puncak (RW 10) Village Ciburial. This Tourist attractions Tebing Keraton , began to steal the attention and crowded discussed by netizens on various Social Media such as instagram, twitter and Facebook and others, as well as the number of posts articles on various blogs, as claimed by the inventor of this new tourist attractions in Bandung, namely Mr. Asep. started when around the month of May 2014, there was someone who came to the village Ciburial cliff location where the palace is located, who later posted a picture on twitter with the background scenery is phenomenal cliff that is often also the surrounding community calls it Jontor cliffs. So, starting from there, a few months later, with the increasing number of visitors who visit to one of these Tourist attractions in Bandung, perpetuate his adventures and traveleled, they post articles and upload photographs of the beauty of this palace Tebing Keraton. so not long enough for tourist sites, according to some people around arguably still is very dangerous and mysterious Hits and so become popular, especially for the netters and also tourists who visit here. In fact, because it was so popular and phenomenal in cyberspace, especially social media Instagram, Tebing Keraton at Dago, Bandung. was dubbed by nature lovers of virtual world with the nickname beautiful cliff. Version of the founder Tebing Keraton at Dago Bandung Mr. Asep, as well who giving a name that is unique cliff called Tebing Keraton with his admiration and appreciation for the incredible natural beauty that is all around Tebing Keraton and also from what is seen from the top of the cliff which is phenomenal. There is a special or way of travel that is unique and different when you come to the Tebing Keraton, If you’ve been to the natural attractions of Bandung such as Bukit Bintang in dago, or Caringin Tilu in the region Bandung east, which is where you’ll be treated to the sparkling city lights of Bandung metropolitan exotic and romantic especially at dusk and at night, but in Tebing Keraton, visitors who come here will be treated with a carpet of green landscape full of aura of tranquility and comfort in the form of thick jungle Wildlife Juanda were so spectacular. Tebing Keraton in Dago Bandung is located at an altitude of about 1,200 meters above sea level, so the height is from Tebing Keraton, we and other visitors will be able to easily and clearly witnessed the expanse of green scenery Tahura Juanda, large extend throughout the eye can see , The scenery here will increasingly exotic and romantic, when we came before sunrise or approximately 6 am to greet the beautiful landscape scenery at Sunrise. The view sunrise or when the sun is rising, which with its rays investigate open fog is hiding behind the green carpet of trees typical Tahura Juanda give the sensation of the morning were very exotic and romantic. Sunlight mist created like a bow beautiful piercing the earth that is created within the mist, of course, would be evidence or traces of camera captured the photographers who willingly and deliberately travel a difficult and tiring since before the dawn toward Tebing Keraton of dago bandung. Experience or special moments that offer a natural attractions, not only in the morning to the moment of sunrise its, also the moments that you should not miss is also the time of the early afternoon to see and feel the Sunset episode or when the sun would sink. we can enjoy the beautiful blue sky with golden colors surrounding silhuet range of hills that underneath there is a green area Tahura Juanda. even the beauty of Tangkuban Perahu is visible from a distance will look clear and beautiful when lit by the sun sets. Yes, do not ever miss, all the beauty of natural scenery in this Tebing Keraton, both at sunrise or sunset, to preserve it in our camera flash shots. As one of the tourist attractions in of Bandung inexpensive but very interesting, in addition to well-known and popular with all the appeal of the beautiful landscape green nature like expanse of emerald sparkling so that increasingly more visitors who come here, it turned out Tebing Keraton also still believed especially by residents of surrounding communities have some mystery and mysticism that accompanies it. Here are the facts about this information from the community about the mysteries and mystical Tebing Keraton of dago bandung, Belive it or not? that’s all up to you..! Communities around the village Ciburial where Tebing Keraton is located, previously familiar hills and cliffs that became a phenomenon today is the name of Pasir Jontor (Pasir in Sundanese language equal to a term of the hill) there are even people who are in part to name Cadas Jontor. Jontor called (in Indonesian could mean, swelling lip) caused by the contours of the rock or stone in the form of Tebing Keraton jutting forward, much like the state of our lips when punched. The origin of the actual, naming Bukit Jontor became Tebing Keraton (by the founder Mr. Asep) are the events that frequently happened in the form of Demoniac to people who come to the Tebing Keraton, and from mystical information obtained from people who Demoniac that they have seen that the places he visited, it is a building shaped of the kingdom, and then spirits watchman rock jontor through people who Demoniac, notifying that the name of the hill jontor should be replaced by name Tebing Keraton, because this location is the building of of the spirits, who inhabit in nature tourism of dago, Bandung. The arrival of beings dwellers of Tebing keraton through a dream, which expressed the desire of the spirits that guard the hill jontor, asking offerings of fruit kawung much as 1 strand of. Intent of the 1 strand of kawung fruit it is meant by a number of human lives, which should be filled with citizens about to become sacrificial lives. 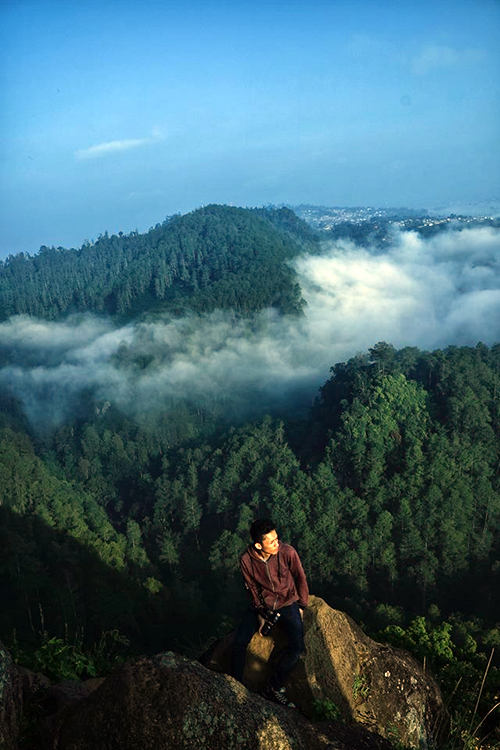 Just below the cliff-top of Tebing keraton, believed by some people around who know a horse moorings for the palace of spirits, one of them named curug Cikiih and Gadogan Kuda. mysteries of giant footprints of cilame Bandung Barat village, which is believed to have something to do with the occult and mysteries of Tebing Keraton. The stones that lie in Tebing Keraton an outcrop of basalt lava flows from Mount Sunda Ancient, who faulted the Lembang fault is always dynamic move until today. The mystery of Keraton at The cliffs there are several springs that flow, one of which is called with Sekegede, in which the water out of the lower limit of the lava flow.The mystery that has not been revealed, about How could springs with a debit amount of water is enormous, yet never run out of all time to the present, which is located just below the hilltop of Tebing Keraton. As one of the exciting new tourist attractions in Bandung, you should be able to understand one thing, which is to matter instructions or directions to the location of the natural attractions of this palace , is still far from perfect. Actually, access to tourist attractions Tebing Keraton not too difficult as well to reach. If you start from the center of the city of Bandung, then start to follow the direction of the tourist area of Dago Pakar, then continued toward the road to Tahura or Juanda Forest Park. Afterwards, you will pass through a gate. After passing through the streets rocky and air is very cool, past houses and settlements, there will be a sign or place a sign for tourists that they’re almost there, you will find a tavern with boards billboards are large enough that read “Warung Bandrek” or popularly known as Warban. from one resting place around the tourist sites Tebing Keraton, bandrek tavern, then the tourists can park their vehicles here. Furthermore, after sufficient rest and recharge with a variety of snacks and warm drinks of a typical Sundanese, then it could resume the journey on foot, riding ojeg sourced from around the tourist sites of Tebing Keraton. A pity indeed to access sufficient road uphill to the location, not enough decent or good condition. The streets are still looked rocky and much damaged, exacerbated where the streets slick mixed with soil. It is also very steep incline and ascertained only load one vehicle to pass such a car. Must be considered to be extra vigilant, because on the side of the road to the top of Tebing keraton, there is a chasm deep enough. Of course, this situation is highly risky if after rain, because it would be very slippery roads. For additional information, may be much more safety when you visit this site, accompanied by the Guide of the surrounding community when you really do not master the field tourist areas. According to the observations some time ago, a visitor who tried to force entry into the cliff-top the palace with motor bikes had had enough hassles to handle. So the solution the most secure, accurate and comfortable, although you will sweat out is by foot. at first to enter the place of nature in Bandung Tourism is actually not determined the amount of the price of admission to the cliffs of this court, because the management conducted by nongovernmental . So that the parking rates have not yet determined. Before finally the management of Taman Hutan Raya Juanda took over the functions of local residents with rates ticketing IDR 11.000 / person with parking money IDR 5000 / person. These safety tips for you. It is expected not to bring small childrens to this location, because it is still very dangerous and risky for salvation. If you must bring along a child when visiting this place, then once again take note of your security and keep your children are doubled and extra vigilant.